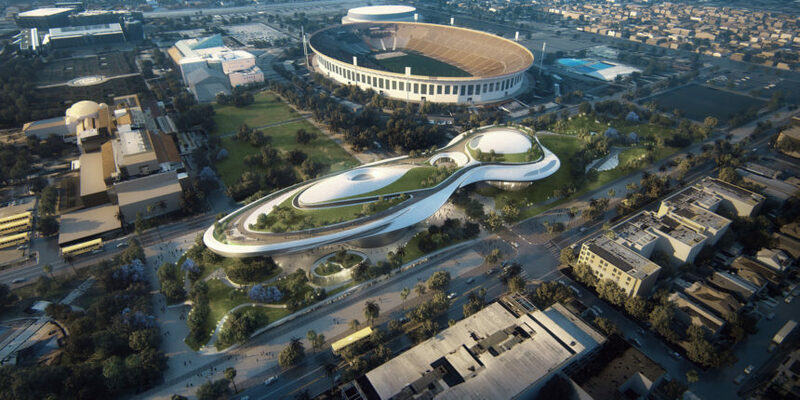 The futuristic-looking Lucas Museum of Narrative Art is on its way to Los Angeles. After searching for a home for almost a decade, LA’s Exposition Park has beaten out potential locations on San Francisco’s Treasure Island and along Chicago’s lakefront as the museum site. It will house George Lucas’ extensive personal art collection and a great deal of ephemera related to the director’s epic Star Wars franchise. Lucas Museum will be in good company too, joining the California Science Center, the Natural History Museum of Los Angeles County and the California African American Museum in Exposition Park. “It feels like this incredible gift has come home. I always thought Los Angeles was the natural place to spread the vision of George Lucas and [his wife] Mellody Hobson, to make art and creativity accessible and inspirational to the next generation,” Mayor Eric Garcetti announced. “We’re going to do something very different, it doesn’t quite exist yet,” Mellody Hobson says. Indeed, Lucas’ art collection features fine art from Rockwell as well as works by Edgar Degas, Pierre-Auguste Renior, N.C. Wyeth and R. Crumb amongst some 10,000 paintings and illustrations and Hollywood memorabilia from Star Wars and his other films. The 1 billion dollar, 275,000-square-foot museum will be a cultural and iconic new force in the city, which has had a huge boom in in recent years with The Broad and the Arts District’s Hauser Wirth & Schimmel opening to great success. Both galleries have injected new life to the city’s strong creative community fortified by cultural stalwarts like LACMA. “The museums are just thriving right now. It’s great to be a part of that,” Mellody says. The museum will screen films daily in its two screening rooms, there will be artist residencies, a library for research and lectures by well known directors. Through collaboration with local schools and USC, the Lucas Museum also hopes to become an interactive learning center of sorts, with educational facilities and classrooms set to be on site.